People often think travel is expensive. And while it can be, it definitely doesn’t have to be! In order to help you to travel cheaper and get maximum value for money, I have collected the 14 best travel budget tips from fellow travel bloggers. Some of these bloggers have been traveling for years, others travel part-time or are just starting their travel adventures. 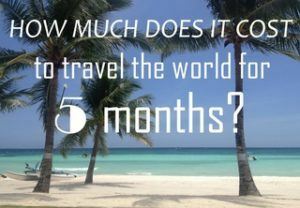 Curious about their advice and the best travel budget tips? TRAVEL BUDGET TIP #1: KEEP YOUR PLANS AS FLEXIBLE AS POSSIBLE! As soon as you start looking for flights on specific dates or to specific airports, you’re going to be looking at a pricier fare. Instead, research prices for dates over a one-month period to see when the best option is. You may also find that flying to a nearby airport plus a bus ride to your destination works out far cheaper, too! Lauren has been traveling full-time since 2011 and writes about her (mis)adventures on www.neverendingfootsteps.com. Her book ‘How Not to Travel the World: Adventures of a Disaster-Prone Backpacker‘ was released this summer (I have read it and can highly recommended it, very honest and a hilarious read). TRAVEL BUDGET TIP #2: SORT YOUR BANK CARDS OUT BEFORE YOU LEAVE! I think the best tip I could give on the subject would be to sort your bank cards out before you leave. When I was in Japan in January my debit card wouldn’t work and I ended up spending a fortune of bank fees to withdraw on my credit card over the six weeks. In Guatemala neither of my cards worked and if it wasn’t for some amazing people I’d just met on the bus I would’ve been scared and alone with no money. I don’t know what I would’ve done. Always carry some spare dollars and at least three cards you know the PIN numbers to. Vicky Flip Flop Travels is the travel and festival blog for people who want to make the most of their annual leave, weekends, money and friends, by exploring the best festivals and coolest destinations. Follow Vicky, her advice and adventures on Vickyflipfloptravels.com. TRAVEL BUDGET TIP #3: TRY TO MEET LOCALS! This can be done with Couchsurfing, but also through Airbnb or other platforms that connects travelers with locals. Learn where they eat, where they buy their groceries, etc. By trying to live like a local you can cut costs dramatically! Who’s awesome travel budget tip is this? Sabrina of www.justonewayticket.com describes herself as just another random girl from Berlin, but I don’t know many girls from Berlin who have over 100.000 monthly readers! On her popular blog she writes about her experiences, disasters and escapades and shares tons of gorgeous travel photos. She has been traveling almost non-stop since 2008 and no plan of settling down soon. TRAVEL BUDGET TIP #4: RESEARCH, PLAN AND RECORD! When we decide to go on a trip, we map out a rough itinerary which helps us with our budget. The tighter our budget is, the more detailed and fixed our itinerary is – this reduces unnecessary spending! We’ll research transport costs, accommodation costs, activity costs, and so on. Quite often, we book accommodation in advance if we find a good deal, and we look at multiple sources for flight deals and will book if we find a cheap one. While we are on a trip, we use the iPhone app Trail Wallet which helps us to keep track of our spending. Petra&Shaun of www.theglobalcouple.com are a mid-20s New Zealand couple who love exploring at home and overseas. They search out amazing street food, scenic road trips, and have a passion for wandering with no destination in mind. They balance writing about the good times of travel with the reality of struggles they have been through while on the road – travel is not always easy! TRAVEL BUDGET TIP #5: WALK INSTEAD OF JUMPING INTO A CAB! The best way to stay on top of your budget while traveling overseas is to walk! Obviously this can be impractical between destinations, however once you’re actually in a city, pick up a local map from your hotel concierge and instead of jumping on public transport or catching a cab, walk! Whether it’s a bus, a train or even a tuk tuk, the cost of public transport while away does add up, and taxi’s can be downright expensive. Walking where possible not only saves you money, though also contributes to staying healthy while on the road, and it’s the best way to discover different sides of a city or neighborhood you wouldn’t have otherwise seen. So instead of shelling out $50 for a taxi from your hotel to the Eiffel tower, pull out your running shoes and go explore. Megan&Mike of www.mappingmegan.com have been traveling & blogging since 2007. Adventure travelers with a passion for new and exciting things, they haven’t been everywhere, but it’s on their list! TRAVEL BUDGET TIP #6: SAVE MONEY ON ACCOMMODATION! For affordable accommodation that’s more comfortable and private than a hostel, we recommend Airbnb. In Europe and North America we can often rent a whole apartment for much less than a hotel room. You can find some great deals on monthly rentals—we rented an apartment in Tuscany for 500 euros a month! We love having access to a kitchen and exploring less touristy neighborhoods. Erin and Simon are digital nomads who sold everything they owned and left the UK in 2010 to travel the world forever. They share their stories on www.neverendingvoyage.com and created the iOS app Trail Wallet to help themselves, and other travelers, stay on budget. TRAVEL BUDGET TIP #7: GO HIKING INTO THE WILD! You want to know how you can see a lot yet spend a little? Go hiking! Traveling on foot has brought me to the most amazing places on the planet, yet it will be the days you spend hardly anything. All you need is some sturdy boots, raingear, a tent and food! If you are going “into the wild” you won’t be tempted to spend money on drinks, activities or souvenirs and usually all you spend is your food (water is for free!) and in case you go on an overnight hike a place to stay. Mountain huts aren’t very expensive but pitching up a tent is even cheaper. Never go without a permit (if required) though, you will annoy the other people on the trail for sure. Some of my favorite places for hiking are New Zealand, Patagonia, Iceland and Scotland. Anto is the travel writer at www.we12travel.com and loves to spend her time in the outdoors, whether it’s close to home or far away. If not traveling she’s blogging, working for a Dutch tour operator or spending time with friends. Check out her site if you need any cool hiking suggestions! TRAVEL BUDGET TIP #8: EAT WHERE THE LOCALS EAT! One of the overall biggest expenses of long-term travel is FOOD! It’s easy to get over-excited in different countries when amazing, local cuisine is so much cheaper than back home. But try and keep an eye on where locals eat… Tourist and backpacker areas are notoriously expensive – plus you’re paying a premium if you’re ordering off an English menu! Learn some of the local-lingo and get out there and find the local eateries. You’ll save a fortune over the course of 6 months if you find these places. Plus it’s a great way to immerse into different cultures – and the locals love it when you try their favorite dishes! Stuart and Eloise of the blog www.aminearlythereyet.com describe themselves as budget travelers who love the very occasional luxury experience. On their blog they share their travel knowledge through humor, photography and video. TRAVEL BUDGET TIP #9: FIND THE OPTIMAL TRAVEL ROUTE! When I travel, I usually stay in budget accommodations, mostly do free activities, and rarely shop. This makes transportation the biggest chunk of my travel budget. To make traveling around as cost-efficient as possible, I research in advance where I want to go, plot it all in Google maps, and then come up with the best route that saves time and money. The best place to use this strategy is in Western Europe. By coming up with the best route to visit 4 neighboring countries, I was able to buy all my connecting train and bus tickets in advance, which turned out to be a lot cheaper than buying a rail pass. Thanks to this, I also spent less time on the road and more time soaking in the sights, and this even allowed me to splurge on a rental car for a few days. Liz of www.lizziemeetsworld.com is a self-confessed type A traveler and one of her favorite parts of traveling is planning it. LizzieMeetsWorld is where she shares her experiences in independent travel, offers tips and practical information, and crafts well-designed itineraries that are perfect for adventurous and independent travelers. TRAVEL BUDGET TIP #10: INVESTIGATE TOURIST CARD OPTIONS! Do your sums about whether to get a tourist card. I usually skip getting them, as often the only way they’re worthwhile is to race around and visit lots of museums in a single day – not my idea of an ideal holiday! However, when I visited Innsbruck last Winter, I bought the pass. I wanted to take the Nordketternbahnen cable car to the tops of the mountains above Innsbruck, which cost €28.50 alone, almost as much as the €33 pass for 24 hours! The tourist cards are also great if it means you can skip the lines at attractions; if you’re think there’s going to be a queue, investigate whether you can bypass it with a card. Shandos is a Sydney-based travel blogger who has been regularly travelling for many years. Her blog, www.travelnuity.com, is aimed at savvy travelers – people like herself who like to find ways to stretch their travel budget further! TRAVEL BUDGET TIP #11: FIND YOUR FLIGHTS ON SKYSCANNER! Skyscanner, one word that can save you so much money. The key to finding cheap flights is to be flexible in both date and destination. Travelling can be done on the tightest of budgets if you are flexible. Recently I have had flights from the UK to Riga (£35 one way) and Melbourne (£445 one way) from Skyscanner by being willing to travel on any date in a given month. You will be surprised how much the price of a flight can fluctuate even from one departure date to the next, so always be sure to search the whole month rather than one particular day. The great thing about Skyscanner is that you can search ‘Everywhere’ for your destination enabling you to search the whole world at once. I have seen flights to European destinations for less than £10 here and for that reason it is always my first port of call. The Office Escapee was created in 2015 as a travel blog about a British man fuelled by a desire to leave behind the 9-5 office life in order to discover the world. Follow Craig on his journey as he gives up his apartment, quits his job, sells his car and sets off to Australia in an attempt to cure the ever growing feeling of wanderlust. TRAVEL BUDGET TIP #12: LISTEN TO WORD OF MOUTH ADVICE! Word of mouth is the best research! I always find that you find out about the cheap, local and fabulous places not by looking in the guide books, but by chatting to fellow travelers. I had no plan in Thailand and would just listen to the cool stories of other travelers and learn about cheap guest houses and great restaurants they had eaten in a few days before. This info tends to be a lot more up to day than any book or even web page! A lot of cheap hostels don’t even have a website and are not on hostel world. In Langkawi, we could not book over Christmas but were told about a cool, cheap hostel that you could just show up at. It was a bit scary to do that the day before Christmas Eve but we rocked up having just got off a night boat at 9am and got a bed for £3 a night over the Christmas period. It was an amazing Christmas… Even if it was monsoon season! TRAVEL BUDGET TIP #13: JOIN A FREE CITY WALKING TOUR! I’ve been on free walking tours when I was in Berlin, Hamburg, Frankfurt, Lisbon, Barcelona, Granada, Seville and many more. What I love most about these tours is the passion the local guides exude for their city. The personal touch of each tour guide why such tours are very popular! You’re free to ask them for the best hunts for local food, the best hangouts at night, and what to watch out for in the city. If you’re wondering how these tour guides earn their keep since these tours are free, they actually work on a tips-only basis. You pay what you feel they deserve, a reasonable tip can range from €5 to up to €20 per person. Isabel is a 21 year old girl from Singapore traveling around Europe to get to know the continent. On her blog www.belaroundtheworld.com she document her travels and provides insight to those who are venturing into foreign land. TRAVEL BUDGET TIP #14: CHOOSE THE BEST BANK! 1. Before you leave, check your bank policies about cash redrawals fees. If they charge a fee for each redrawal, consider opening an account at a bank that doesn’t. Read more about cheap bank card options for travelers here. 2. Once on the road, it matters where you get your cash. Citybank for example didn’t charge us a fee in the Philippines and Vietnam for our redrawels with a Maestro card. Neither did Bank of New Zealand (BNZ) but ANZ did. In other Asian countries the fees varied per bank, so it’s worth looking around for the cheapest option since the small fees add up the longer you are traveling! Obviously I couldn’t omit my own travel budget tip from this list:-) Thank you for reading my stories at Phenomenal Globe Travel Blog! Find out more about me or contact me if you have any questions or want to say hi! Check out their sites for more travel inspiration! In need of more budget tips? Check my budget breakdown posts for the Azores, Cambodia, Croatia, Hong Kong, Japan, Ireland, Laos, Malaysia, New Zealand, the Philippines, Sardinia, Singapore, Thailand and Vietnam. Download the best travel budget tips below! Previous Post: « 12 Days In Malaysia: How Much Does It Cost? Hey Meg, I’m glad you find the tips helpful! There is definitely such a thing as a foreigners price;-) Thanks for collaborating and happy travels! Hey Liz, I am glad you liked the budget tips:-) Thanks for sharing yours! Hey Lotte! The post is great 🙂 Thanks again for featuring our tip! Happy travels! I am happy that you like the post and thank you for the great input! Thank you Craig! I hope you can put the other tips to good use for your big Australia Adventure! Thank you Zascha! Yes, having some cash and different bank cards is as much a budget tip as it is a tip to stay safe. I have been out of cash once in Manila and it was not a good position to be in. In Europe having the embedded CAC chip on at least one card is a great benefit too.These haven’t become universal in the states yet.I know often you can’t use a magnetic strip for some purchases like renting the municipal bikes in Amsterdam and Paris. I almost always buy the museum passes,regional or city passes.Check around to see which is the best deal nad way the benefits depending on your plans.Skipping the queues is the biggest benefit.Remember your time is valuable! Thanks for the post and mentioning my tips about hiking 🙂 loved reading what the others wrote, too! It’s always good to be reminded of the fact that travel doesn’t necessarily have to be extremely expensive! Very welcome:-) Glad you find them useful! Great compilation! Free walking tours, the real ones with no “shopping” itinerary, are the best. They are usually done by people with a real passion for what they are doing. The guides want nothing more than for you to enjoy and love their cities. A lot of times, you also get to meet all sorts of cool people. Thank you! And agreed, walking tours by locals (without commercial stops;-) are the best, so nice to hear their inspiring and interesting stories. Much more personal than a guide book.